Ariel was born at SeaWorld Orlando in June of 2002 and joined the SLEWTHS family in the summer of 2003. She completed some foundational training with us and then spent a year and a half with a colleague of ours, while our current facility was being constructed. It was there that she was introduced to a life of travel for public outreach programs throughout the United States. In May 2005, Ariel returned to SLEWTHS, where her focus was on learning the remainder of her medical exam and obedience behaviors. Since then, she has been progressing with her show and public interaction behaviors, and is currently one of the primary animals performing with Sea Lion Encounters. 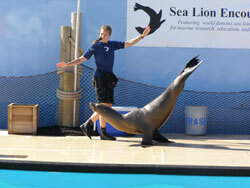 Ariel is a very inquisitive, playful sea lion who enjoys interacting with her trainers and fellow SLEWTHS sea lions. She is very creative when it comes to making up new and exciting games to play, and is a fast learner inside training sessions as well. She is one of the anchor animals for our Sea Lion Encounters program, taking part in multiple public outreach events each year. The future is definitely bright for our little, superstar sea lion, Ariel. Take a look at Ariels incredible art work!